LinkedIn has finally revealed to me how it can produce more leads and sales for a business and I did it without even trying. I started my LinkedIn profile in 2007 and setup my profile just like the pros. Got a bunch of connections and then just sort of left it be. I thought the whole purpose of LinkedIn was to just wait for connections to happen. Boy was I way off! Since starting my LinkedIn profile, I’ve spent far more of my online social networking time with other systems like forums, Facebook, most recently Twitter. I’ve had leads, made sales, increased my opt-ins with every single one of those systems…but nothing from LinkedIn…until the last two weeks. Today is Friday. On Wednesday night, I sat in my recliner for the second half of the Denver Nuggets once again destroying New Orleans in the basketball playoffs. During the last 10 minutes of the half-time report and commercials, I read questions people were making in groups I had signed up to be a member of (free member of course). After the game was over I just sat in my chair for another 30 minutes joining another 3 groups and posting a few questions of my own and answering others. #1 is a lead, someone asking me about what kind of Web site work my HereNextYear company does for clients. #2 is an opt-in to a subscriber list for my Ultimate Blog Setup Checklist site. #3 is a product sale where someone bought one of my e-manuals and #4 is an invitation to join someone’s linked in profile. The rest of what you see in my email there are from comments made to the groups I belong to after I made comments to them. So, about 80% are people commenting about my comment. 3) Click the “Groups” link from within your profile to search for groups where your target audience might be already members. 4) Join 10 or more groups if possible and choose some groups that have more than 5000 members. It’s okay to belong to some groups that have smaller membership numbers, but you need to be part of some larger groups just for sake of volume. For any group member that has the “email me every time a comment is made to this group” activated, when you make a comment, an announcement will go out to everyone on that group list. 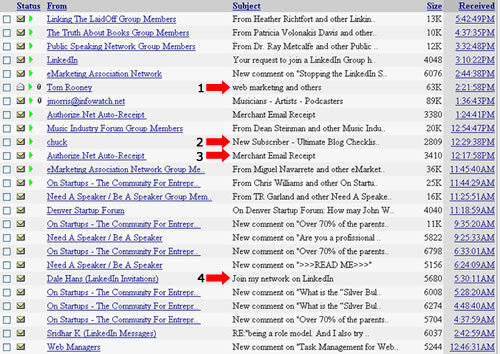 That’s what you see in my e-mail inbox image above besides the #1,2,3,4 is notices that comments have been made to the group I’m participating in. 5) Every time a notice DOES come in to your email, read the reply and engage in more conversation. One conversation I was participating in is about LinkedIn spam. It was such a popular topic that there were 4 pages of comments within a week’s worth of discussion. I shared my opinion on the first page of the comments but then added more comments to make sure I had visibility on other pages too. So, keep track of those discussions and participate frequently. Should you ONLY participate in LinkedIn groups with the intent of getting sales or leads? YES is my opinion! That’s why we spend time on the Internet for social networking. But, the WAY in which you do it is important too. Don’t just be salesy about it. Simply make comments and share your opinions and expertise. When you write good responses, people will send you emails saying “Hey, great comment to that question and thanks for the help.” And, that’s when you know you’ve made a great first impression. Someday, a person like that could turn into a client, an opt-in, or even a recommender for your services. And, that’ is the power of how LinkedIn can help you get leads and sales without even trying.